Nowadays most of us using Gmail and also more than one account and other Google services like Google Drive, Picasa, Youtube etc. Most of the time we need to open more than one account at the same time for this we’ve to sign out from one account then sign in to the other account it is a irritating process. 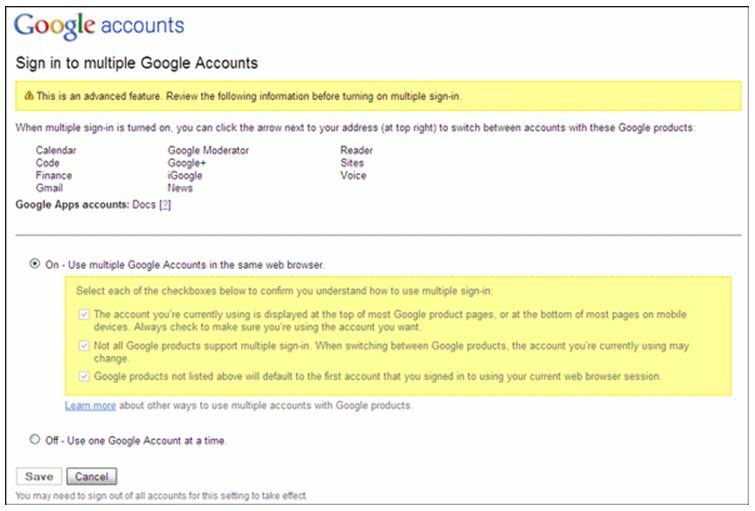 For this Google has given setting to open Multiple Gmail Accounts in same browser at same time. So, with multiple sign-in, you can log in to more than one account using the same browser session. You can sign in to ten accounts at a time. Multiple sign-in is supported across a range of Google products like Gmail, Google Drive, Picasa, Youtube, Calendar, Google Docs, Google Sites, Reader, Voice, and Google Code etc. But first you have to enable it. Sign in to your account with your default Google username and password. Select On to enable the multiple sign-in feature and select the checkboxes to confirm that you understand how to use multiple sign-in. Remember – You need to enable multiple sign-in feature in each of your accounts which you may want to open at the same time. Once the multiple sign-in feature is enabled, you can log into another Google account by clicking on your name or email address at the top-right of the page. Then select the account you want to access or sign off from all accounts. You can read more about it and address any issues you are having via the Official Google page explaining multiple sign-in. The other bit of good news is that multiple sign-in support has been extended to Gmail for mobile too.